Posted in Carpet, Tile & Grout Cleaning.Tagged auto, carpet cleaning, furniture, grout & tile cleaning, San Diego County. I met Kevin Cole in this business networking group (B2B of San Diego). Because I used to be a professional carpet cleaner, the first presentation Kevin made to our group where he discussed his equipment, his practices and his philosophy of life. I decided the next time I get my carpets cleaned I will use him. His prices are reasonable enough that I probably won’t be renting a cleaner from the grocery store again. His athleticism, winning smile and commitment to excellence and demonstrated integrity make me happy to recommend his service to others. People in the group who have used him have sung his praises in his ability to clean carpets, grout, and even tile. 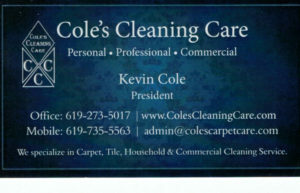 Cole’s Carpet Care is really good for services thanks for sharing this blog.